The attack was fast and surprisingly silent. Before Lisa Hubert knew what was happening, her dog, Buddy, had disappeared into the pitch-black night with barely a sound. Buddy, owned by Lisa and Kim Hubert, was killed by wolves Dec. 5, 2007. "He started to bark and it turned into a yelp, then it was really muted," Hubert said. "I turned around and he was gone, just gone. It was dead silent." She walked into the woods a bit to find Buddy but couldn't. Hubert and her husband, Kim, returned the next morning and found their dog's head and collar about 50 yards off the road. Buddy, a 10-year-old Nova Scotia duck-tolling retriever, was the second dog killed by wolves in the Anchorage area in the last couple of weeks. Wolves believed to be from the same pack also have fought with three other pet dogs, all while their owners were walking them in the northeast reaches of the city, according to the Alaska Department of Fish and Game. The wolves stalked but didn't engage a pair of dogs in a fourth incident Saturday, said Rick Sinnott, the state's Anchorage area wildlife biologist. The first attack took place Nov. 28, when 34-year-old Kirsten Kidd and her boyfriend, Perry Crane, were walking three dogs behind the Alaska Railroad track near Eklutna around 1 p.m., Kidd said. A large, black wolf appeared on the trail about 50 yards ahead of them, and Shellbee, a 9-year-old pointer mix, took off after it, followed closely by the other two dogs, a Saint Bernard and a golden retriever. The wolf waited until the dogs got almost on top of it then ran into the tall grass, where the rest of the pack was waiting. Then, like a scene out of "Jurassic Park," came a flurry of thrashing grass and howling dogs. Kidd and Crane had been yelling for the dogs to come back, and when Shellbee cried out, the other two obeyed. "I really don't know how they got away," Kidd said. "We thought we had lost three of our dogs." The two uninjured dogs ran back and Kidd, Crane and the dogs backed away down the trail. Crane returned in his truck a few hours later but couldn't find Shellbee. Wildlife officials found the pointer's chewed collar and a few bone splinters in a trampled, bloodstained area about 100 yards from the trail two days later. The second attack occurred after dark Dec. 4. Korah Heagy, 30, and her border collie mix, Bree, were on a lighted loop of the Beach Lake trail system in Chugiak when a gray wolf appeared on the trail ahead. The wolf didn't appear aggressive, Heagy said, but Bree rushed it in excitement. Then a second wolf appeared. "I was like, 'Oh my gosh, there's a whole pack out here,' " Heagy said. Heagy called to Bree, who was able to run back unharmed, she said. They walked back toward her home, only about five minutes away, as the wolves followed. The next day, the wolves killed Buddy. The most recent encounter came Saturday, when Janet Read was walking two dogs on a gravel road northwest of Elmendorf's flight line, Sinnott said. Once again, a black wolf appeared on the trail, about 50 yards behind her, the lab-retriever mix and a friend's golden retriever. When Read yelled at the wolf, it walked back into the woods, Sinnott said. But moments later, the black wolf reappeared, this time with two gray wolves. They followed her for about 15 minutes until she reached the main road and her vehicle, despite her yelling at them the whole way, Sinnott said. There are between 25 and 30 wolves in the Anchorage area in four or five packs, Sinnott said. There is a pack in the 20-Mile River area, and another near Lake George and the Knik River. There may also be a distinct pack near Eklutna and Peters Creek that mostly dwells in Chugach State Park. Only two packs regularly come into contact with people, Sinnott said. One is the Ship Creek pack, which roams the Chugach and Fort Richardson, sometimes going into Far North Bicentennial Park. The other is the Elmendorf pack, known as such because it frequents the base, though it ranges across Fort Richardson as far north as the Palmer Hay Flats and possibly beyond, Sinnott said. The pack is made up of one black wolf and up to five gray wolves, according to military wildlife agents. The Elmendorf pack is getting the blame for the recent attacks. A few dogs in Anchorage yards get killed by wolves each year, Sinnott said. "It's unusual, but it happens occasionally," Sinnott said. "It's much more uncommon to have wolves take them down while someone is walking them." It is unclear what is causing the recent emboldened behavior in a generally shy species, he said. There has never been a documented case of rabies in Southcentral Alaska, so that would be unlikely, he said. Attacks on dogs seem to increase in winters with little or no snow, probably because moose are harder for wolves to kill when there's little snow to bog them down and make them easier targets, he said. 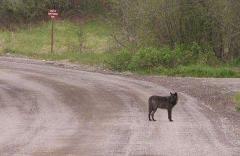 In recent weeks, a wolf pack near Fairbanks has killed at least three dogs. State wildlife officials suspect that pack, which has been roaming the area for more than a month, ate one dog in North Pole Oct. 31, then another at Mile 19.5 on Chena Hot Springs Road Nov. 23. Most recently, a dog owner in Two Rivers going to feed his dogs chained up in the yard found one missing Dec. 4. All that was left were a few pieces of collar on top of some bits of intestine. Following the unusual attacks here, Anchorage wildlife officials are taking some precautions to ensure the wolves don't get too bold, Sinnott said. "Because they are recently confident around people, there is some risk of them attacking a person," he said. "A pack of wolves is a pretty efficient killing machine, and a person by himself is pretty helpless." Trappers have already been targeting the Anchorage wolves, and by catching a few, they should help keep the predators in check and more timid, Sinnott said. On Elmendorf, officials have been given the green light to engage in some "reverse conditioning," said Herman Griese, a wildlife biologist there. Late this summer, a single wolf was apparently killing cats in the base housing area near Ship Creek, he said. To stop the attacks, military wildlife agents plan to use their own dogs, in some cases, to bait the wolves, then scare them off using pyrotechnics, rubber bullets, buckshot and pepper spray, he said. The idea is make them afraid of humans. Wildlife officials recommend keeping dogs on a leash or under close voice control. A leash is best because even if a dog is generally well-trained, it might not heed commands when a wolf is aggressively stalking it, Griese said. Carrying pepper spray is another precaution people can take, he said. Find James Halpin online at adn.com/contact/jhalpin or call him at 257-4589.